St Andrew’s CE Primary School is a Lead School for Initial Teacher Training based in Chinnor, Oxfordshire (SATA: St Andrew’s Teaching Alliance). 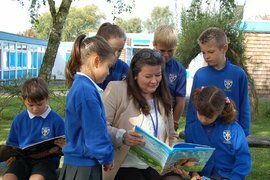 We are currently working alongside Oxford Brookes University and a partnership of 4 primary schools. Our aim is to provide the best support and training for those with a passion to teach. If you wish to join us and belie you have the necessary skills, qualifications and personal attributes, please read on, we would be delighted to hear from you. Emily trained with SATA this year. "Completing my teacher training through SATA was the best decision I could have made with my teaching journey. The ‘on-the-job’ training and experience is invaluable – you see, and are involved in, every aspect of school life throughout the entire year. From the first day of school, transitions, plays, performances and planning, to parents’ evenings and sports day, all the aspects which could be incredibly daunting going into your first teaching post, you have already been a part of. Being attached to a class means that you build amazing teacher-pupil (and teacher-parent!) relationships. A 6 week placement at a different school pushes you out of your comfort zone and allows you to see a different school environment and new ways of doing things. You are treated as a teacher and encouraged to take on the responsibility and thinking of one; but the support, mentoring and teamwork is fantastic and means that you can go through the year with confidence. Weekly observations and meetings with your teacher tutor are a great opportunity to reflect and set targets to ensure your continuous progression. The teaching load gradually increases throughout the year to ensure that you are ready for the transition into your NQT year – I am finishing my year feeling as though I am already a valued teacher within a fantastic school. There are always people to help you, no matter how minor you think your question may be – one piece of advice I would give is to ask as many questions as you can. There is a wealth of experience within the school, use it! I have now been lucky enough to have been offered a teaching position at St Andrew's CE Primary School, a role which I am confident and excited to take on thanks to the experience I have had this year." Are you looking for a career change? Are you currently assisting teachers within a school? Do you have aspirations to be a teacher yourself? We require for September 2018, an excellent graduate to join team as a trainee teacher. Applications from all graduates will be welcomed. SATA (St Andrew’s Teaching Alliance) is a Lead School working with School Direct and Oxford Brooke’s University to train teachers. We are looking to recruit graduate trainees for the coming academic year. The course will last for one year and result in qualified teacher status (QTS). You will train in two good schools, with the opportunity to work alongside professionals in a practical, and theoretical, way. You will be part of a team from the very start, receiving intensive support from experienced teachers and mentors. Although the position is unsalaried, you are eligible for student finance and can apply for the same financial support as other students, such as student loans. St. Andrew’s Church of England Primary School is a rapidly expanding and popular school, set at the foot of the Chiltern Hills amid stunning grounds. The school’s motto ‘Learning together, we achieve great things’, is central to all that we do. We require for September 2019, an excellent graduate to join our team as a trainee teacher. Applications from all graduates will be welcomed. Would you like to be part of our exciting, happy and forward thinking school? Visits to the school are warmly welcomed. Please contact Bex Stott on the school telephone number 01844 351353 or email the school office: office.3182@st-andrews.oxon.sch.uk for further details, to find out when the next round of interviews are being held, or to arrange a visit to the school. The tuition fees for the course for September 2019 are £8000. Alternatively, you may choose to pay the tuition fee out of private funds. You have to pass the professional skills tests in numeracy and literacy before you begin your teacher training. Understand the importance of providing a stimulating learning environment, both indoors and out. A positive, enthusiastic approach to learning and gaining new skills through teamwork and training opportunities. Willingness to contribute to the wider school community, for example, after school clubs/assemblies. All applicants must have passed the literacy and numeracy professional skills test before starting their training with us in September.